Coach Laura Rubinstein is known for her Marketing and Relationship Development Consulting. As a Certified Social Media Marketing Strategist, Hypnotherapist and Master Leadership Coach, she works with business owners, speakers, authors, and service providers around the globe. With more than twenty years of marketing experience and focus on relationship building, Laura’s creative, innovative, and elegant strategies make her a highly sought after professional. Specializing in social media training, consulting and strategy development for business owners, Coach Laura works with professionals helping them to develop their brand and buzz on social media. Laura has mastered the art of relationship building and coached more than 1,000 business owners in relationship based marketing strategies. Using her hypnotherapy background, Laura brings a keen awareness of habits and motivators that cause action and results. As a graduate of one of the finest engineering schools in the country you may be wondering how Laura Rubinstein got into the world of marketing and executive coaching. Her passion and desire to connect and create fulfilling relationships has always been her ally along with her analytical nature in helping business owners sky rocket their business success. Laura will align with your vision and co-create a strategy to reach your professional and personal goals. Partial Client List and Detailed Experience available upon request. 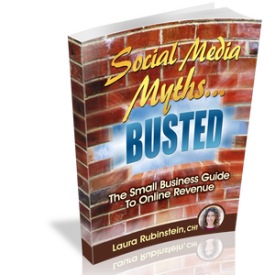 Laura Rubinstein’s articles and interviews have been featured in Social Media Mags, KFWB LA Business Rockstars, BlogTalk Radio appearances, and on blogs like VIV Magazine, GenConnect.com, and a variety of other blogs.